to convey non-aggressive liquids and gases. 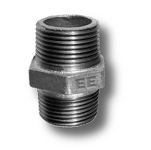 Check Our Malleable Iron Fittings – Products Range to click here and if you need more information please, don’t hesitate to contact us. Our staff will be glad to help you in any your requirements. 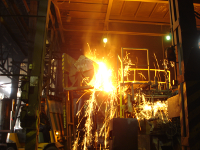 Fittings: white malleable EN-GJMW-400-5 cast iron, according to EN 1562, equivalent to W 40-05 ,according to ISO 5922. EE brand fittings can be supplied in accordance to order: with black or galvanized surface According to EN 10242, zinc oating weight relative to the surface exceeds 500 gr/m², which corresponds to an average layer thickness of 70micron. Both black and galvanized surfaces are protected against corrosion. Corrosion protection substance does not contain polycyclic aromatic hydrocarbons. 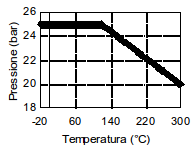 Our Malleable Iron Fittings can perform at the highest admissible working pressure and temperature ranges quoted in the left table. Constructional symbol A is characterized by the following material: whiteheart, malleable cast iron EN-GJMW-400-5. 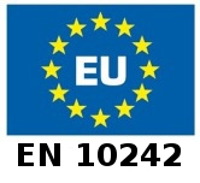 According to EN 10242, each EE brand fitting is subjected to a leak test at air pressure of at least 0,5 MPa / 5 bar, which is equivalent to a minimum hydrostatic pressure of 2.0 MPa / 20 bar/. Threads of lock-nuts, union nuts and threads mating with them – according to ISO 228-1. NOTE: Conical unions and conical union details cannot be used twice because it will not guarantee the joint leak tightness. Higher parameters to be agreed upon orders. The thickness of gaskets for flat unions from 3/8 ÷ 11/2”- 2 mm and from 2 ÷ 4” – 3 mm. The gaskets and other seals measures to the threads used by the customers shall comply with the requirements and standards appropriate to the type of installation. 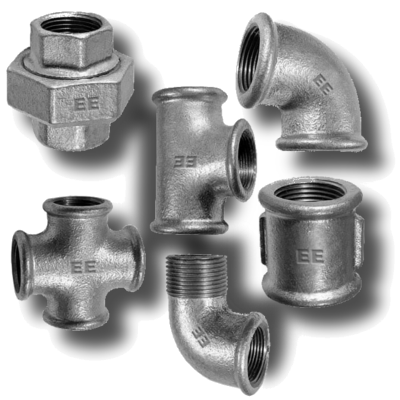 If you need more information about Malleable Iron Fittings please, don’t hesitate to contact us. Our staff will be glad to help you in any your requirements.